The U.S. Chamber of Commerce wants a 25 cents-a-gallon increase to raise $400 bln for investment in transportation. It seems a contrary proposal coming from a group whose members just secured huge tax cuts. 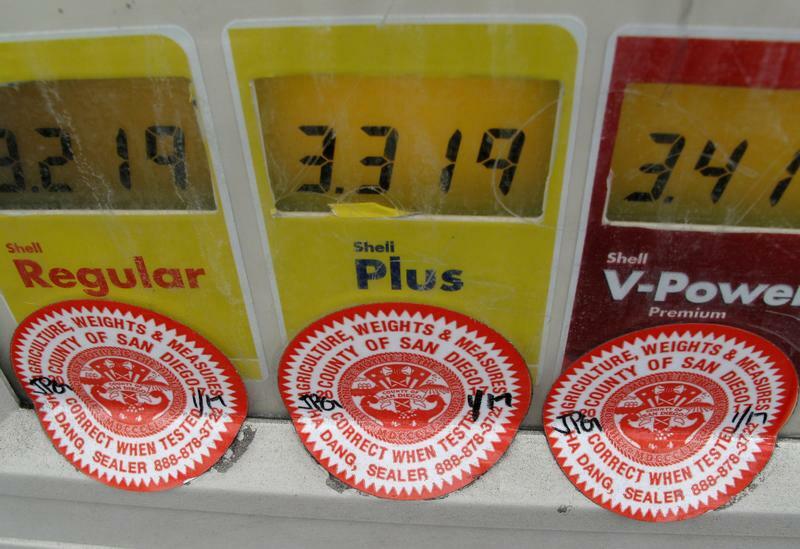 But it makes sense: American gas is cheap, and a higher levy is overdue. California government stickers are shown on a gasoline pump in Encinitas, California, U.S., October 30, 2017. Thomas Donohue, chief executive of the U.S. Chamber of Commerce, said on Jan. 18 that the business group supports a phased-in 25 cents-per-gallon (6.6 cents per liter) increase in the U.S. federal gasoline tax in order to fund improvements to roads, bridges and other transportation systems. With the levy indexed to inflation and fuel economy, the chamber estimates the proposal would raise almost $400 billion over the next decade and cost the average American around $9 per month. President Donald Trump may preview an infrastructure improvement plan during his State of the Union address on Jan. 30 though the details are not expected until later, Reuters reported on Jan. 18. The plan will probably recommend some $200 billion in federal funding over 10 years – reiterating last year’s White House budget proposal – with the goal of encouraging over $1 trillion in private, state and local funding.